As promised, you will see a couple small versions of me as a pin up for the Accordion Babes Calendar project but first here’s the pitch. The Accordion Babes calendar will include 12 full-color pin-up photos of women and their accordions; previews of some of the content are available here. Not all of these are final photos, but they start to give you an idea. A compilation CD of the calendar artists will be attached to the inside back cover of the calendar. Participation can happen in two ways: presales and sponsorships. For shops and accordion clubs who would like to order advance copies at a wholesale rate, we are selling copies of the calendar at $10 per unit; the list price of the calendar will be $20. (There is a 6 calendar minimum for presale orders.) For businesses who are interested in having ad-space on the calendar, there is a pricing scale for sponsorships. Please pass on this info to any potential sponsors you can think of. These will make wonderful gifts. 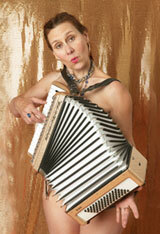 I’m hoping you’ll buy the calendar to see all the accordion goddesses at full size. accordions, babes, calendar, gift idea, pin-up.